A fine way to end the ‘on time in ’09‘ initiative. 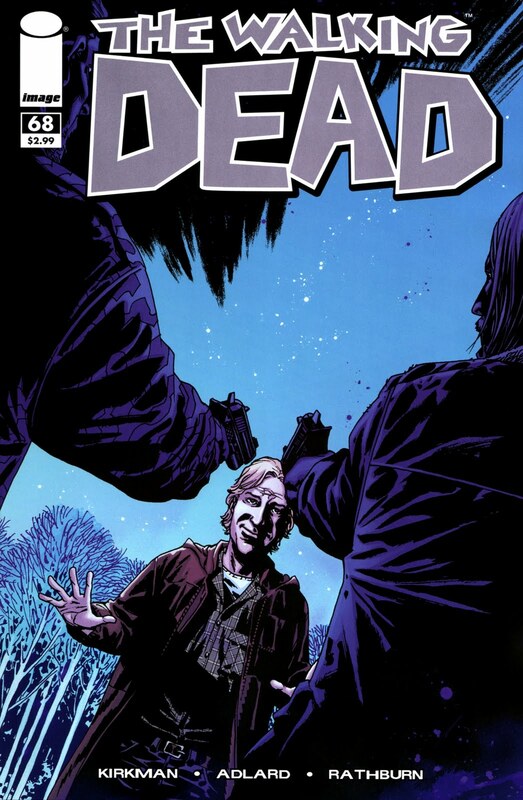 Kirkman, Adlard, Rathburn & Wooton have all collaborated to bring 12 issues on the promised solicitation date, and the quality has always been high (sometimes more so), with Adlard especially excelling himself over the year. This issue is a lead in to the new storyline that will see Rick and the others begin a new start in a ‘safe’ community in Washington DC. Their first encounter with one of the community, a guy called Aaron, is tense even though Aaron is at all times relaxed, trusting and keen to get them on board. Not surprisingly, following Woodbury and the recent encounters with the ‘Hunters’ and Eugene’s revelations, Rick, Andrea & Abraham are much less trusting. However, common sense prevails and by the end of the issue we have a consensus among the group that this community idea could give a purpose to their lives. Doubts about the trustworthiness of Aaron, and his partner Eric, remain, however. We get some zombies! Quite a few of them, and we get to see who can handle themselves when the undead lurch out. Michonne, Carl, Glenn, Rick, Abraham, Andrea, Carl and (is this a hint?) Aaron all show themselves to be more than able. Morgan however, really needs some practice. We get a very real sense that the likes of Rick, Andrea and Abraham are like coiled springs, just waiting for one false move from Aaron and Eric. We are being shown that the community they will soon join is going to have to handle a bunch of desperate people who are suspicious of everyone and willing to main and kill to protect themselves. This should be very interesting indeed….